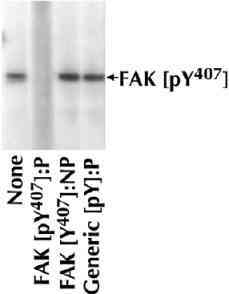 Phosphorylation site-specific antibody selective for the phosphorylated form of the Focal Adhesion Kinase enzyme containing a phosphate on tyrosine 407. The antibody has been shown to recognize Focal Adhesion Kinase (approximately 125 kDa) in chick embryo fibroblast cells plated on fibronectin. Synthetic peptide derived from the region of Focal Adhesion Kinase that contains tyrosine 407. The sequence is conserved in human, mouse, rat, chicken and frog. Focal Adhesion Kinase is a non-receptor protein tyrosine kinase discovered as a substrate for Src and as a key element of integrin signalling. Focal Adhesion Kinase plays a central role in cell spreading, differentiation, migration, cell death and acceleration of the G1 to S phase transition of the cell cycle. The activity of the phosphorylation site pTyr407 is currently unknown. Purified from rabbit serum by sequential epitope-specific chromatography. The antibody has been negatively preadsorbed using (i) a non-phosphopeptide corresponding to the site of phosphorylation to remove antibody that is reactive with non-phosphorylated Focal Adhesion Kinase enzyme and (ii) a generic tyrosine phosphorylated peptide to remove antibody that is reactive with phosphotyrosine, irrespective of the sequence. The final product is generated by affinity chromatography using a Focal Adhesion Kinase-derived peptide that is phosphorylated at tyrosine 407. Our Abpromise guarantee covers the use of ab4814 in the following tested applications. WB 1/1000. Predicted molecular weight: 125 kDa. ab4814 has not yet been referenced specifically in any publications. Publishing research using ab4814? Please let us know so that we can cite the reference in this datasheet. There are currently no Customer reviews or Questions for ab4814.